Tonight I was working on the Romans 1 study from my small group Bible study and thought I would share. Pray the Lord's word is a blessing to us all this evening. For the wrath of God is revealed from heaven against all ungodliness and unrighteousness of men who suppress the truth in unrighteousness,19 because that which is known about God is evident within them; for God made it evident to them. 20 For since the creation of the world His invisible attributes, His eternal power and divine nature, have been clearly seen, being understood through what has been made, so that they are without excuse. 21 For even though they knew God, they did not honor Him as God or give thanks, but they became futile in their speculations, and their foolish heart was darkened. 22 Professing to be wise, they became fools, 23 and exchanged the glory of the incorruptible God for an image in the form of corruptible man and of birds and four-footed animals and crawling creatures. 26 For this reason God gave them over to degrading passions; for their women exchanged the natural function for that which is unnatural, 27 and in the same way also the men abandoned the natural function of the woman and burned in their desire toward one another, men with men committing indecent acts and receiving in their own persons the due penalty of their error. 28 And just as they did not see fit to acknowledge God any longer, God gave them over to a depraved mind, to do those things which are not proper, 29 being filled with all unrighteousness, wickedness, greed, evil; full of envy, murder, strife, deceit, malice; they are gossips,30 slanderers, haters of God, insolent, arrogant, boastful, inventors of evil, disobedient to parents, 31 without understanding, untrustworthy, unloving, unmerciful; 32 and although they know the ordinance of God, that those who practice such things are worthy of death, they not only do the same, but also give hearty approval to those who practice them. Psalms 8 comes to mind as well (out of the mouths of infants you have ordained praise). What are common Christian reactions to sin? 1. Defeat - nothing we can do anyway, why try? 3. Condemnation - Doom and gloom - sensationalism. We feel better about ourselves and less insecure, by comparing ourselves to those who are "worse"
2. Arguing every fine point and detail about the Anti-Christ, 10 horned beast, the False Prophet, Gog and Magog, The Burden of Damascus, the Mark of the Beast, Pre/Mid/Post trib, Pre-wrath, Armageddon… The gnostic spirit is alive and well. Many believe they are saved by their inside knowledge, as if some better understanding was going to help our righteousness before a HOLY PERFECT GOD ALMIGHTY. This deep need to get everyone to think the same way in some kind of self-validation, is just another expression of works based fear. God said spread out, fill the earth, depend on Him. We are not the Tower of Babel self-validating collective. I'm not condemning diligent study. It is commanded. 3. MREs, Preppers, Guns, Ammo, Montana, Bunker and self-directed survival. Reminds of the Essenes - the dead sea scroll people. Isolationists. I'm not condemning preparation, but self-centered isolation. There is work to do in the kingdom and we the church are plan A - there is no plan B. Ever notice that the red states and blue states are divided by population density? Those jammed into large urban centers, abandon God and vie for the will of the collective wisdom of the day. On the other end I often see those that scream for freedom at every venue, with little regard for the fallen, broken depravity of the black horse of commerce. Rarely. Very rarely, do I find someone who comes to me to share their top 10 list, with a broken, earnest, diligent prayerful heart, who is working out their salvation with fear and trembling. The answer: we are to be at our post and be diligent. 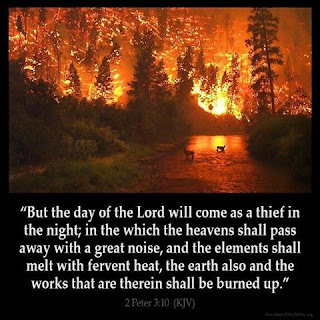 But the day of the Lord will come like a thief, in which the heavens will pass away with a roar and the elements will be destroyed with intense heat, and the earth and its works will be burned up. Very good thoughts. Blessed by this this morning. It's really not about arguing the finer points, but being generally aware of the lateness of the hour, how close it appears we are, and how focused are mission needs to be in these "last minutes, of the last hour, of the end of the age" (as J.D. would say).